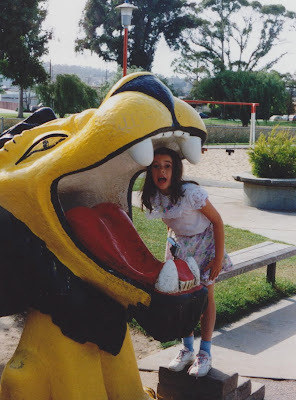 This photo shows first-grade me enjoying the lion-head drinking fountain at Dennis the Menace Park in Monterey. I think I was pretending to be scared that the lion would bite off my head. Does anybody know if this drinking fountain is still there? You could try to spot it with satellite view on google maps.